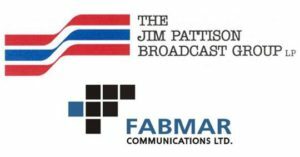 The Jim Pattison Broadcast Group Limited Partnership (Pattison) and Fabmar Investments Ltd. (Fabmar) today jointly announced Pattison’s acquisition of Fabmar Communications Ltd. and it’s four radio station licences (and related assets) located in the provinces of British Columbia, Alberta and Saskatchewan, subject to CRTC approval. The current local management teams will continue to lead the Chilliwack, Whitecourt and Melfort stations and all of the existing team members at the four Fabmar Communications stations will be offered positions and the opportunity to grow with the Jim Pattison Broadcast Group. Adrian Fabro, Secretary Treasurer of Fabmar announced the transaction today stating, “Our family has enjoyed our time as committed members of the Canadian Broadcast industry. Many friends have been made along the way and we take pride in the accomplishments and the excellent job done by the dedicated Fabmar team of professional broadcasters. It has been our pleasure to serve our listeners and clients over the past five decades. We are confident that the Jim Pattison Broadcast Group is the best choice to provide future opportunities for growth and success, not only for our radio stations and team members that operate them, but also for the communities they serve. Schween went on to say, “Subject to regulatory approval of this acquisition, we are confident that it will benefit the Canadian radio industry as a whole and will allow Pattison to continue competing against some of Canada’s largest national players who are well-established in the West. The sale is subject to approval from the Canadian Radio-Television & Telecommunications Commission (CRTC), for which an application was recently submitted. This sale follows the successful recent Pattison acquisitions in 2015 of CIKT-FM Grande Prairie, AB from Bear Creek Broadcasting and stations in Edmonton, AB, Prince Albert, North Battleford and Meadow Lake, SK from Rawlco Radio. As part of the terms of sale, Pattison has also agreed to purchase FabVision, an outdoor signage business in Saskatchewan and online news portals mychilliwacknews.com, mytowntoday.ca and yourtownnews.ca, serving the residents of Chilliwack, Whitecourt and Melfort & their respective surrounding areas. This grows Pattison’s radio footprint as they will own and operate 44 FM, 3 AM radio stations in western Canada, along with 16 online news portals, 3 conventional television stations and 1 outdoor video signage division, subject to approval of this transaction by the CRTC.